One of my biggest makeup application secrets lies on the power of a silicone foundation primer. A foundation primer is a silky, clear liquid that you apply on your face before you put on your makeup base (it is either foundation, tinted moisturizer or cream powder or a combination of these). Although a foundation primer is marketed as more of a luxurious addition to your makeup routine, I consider it more of a necessity. I bought it for the first time when I was getting my makeup kit ready for my wedding. I wanted and needed an extremely smooth, flawless face on my big day. I trusted reviews on Smashbox's Photo Finish Foundation Primer. 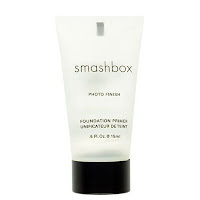 Smashbox Photo Finish Foundation Primer has, since then, become a staple product in my makeup kit. I used to save this formula for rare, formal evenings that require serious dressing up. Today, however, I use it everytime I go out because my skin looks extra smooth when I wear it. I make sure I put it on the rough edges and lines on my face, let it completely sink in, and apply my reliable combo of MAC Studio Fix Liquid in NC40 and Laura Mercier Oil-Free Tinted Moisturizer in Fawn. Tried other brands of foundation primers but Smashbox's performance beats the rest of 'em by a mile.